It was dangerous living in a big city during the war. Cities were the target of enemy aircraft that flew over at night and dropped bombs. At 4:56pm on 7 September 1940, the air raid sirens wailed as the German Air Force, the luftwaffe, launched a massive raid on London. Over 350 bombers flew across the Channel from airfields in France and dropped 300 tonnes of bombs on the docks and streets of the East End of London. The enemy attacks from the Luftwaffe (the German air force) were called Air Raids. The heavy and frequent bombing attacks on London and other cities was known as the 'Blitz'. Night after night, from September 1940 until May 1941, German bombers attacked British cities, ports and industrial areas. 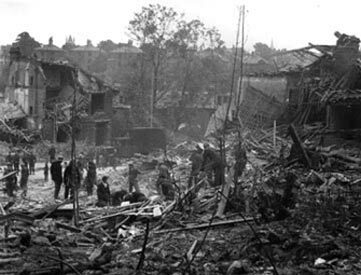 London was bombed ever day and night, bar one, for 11 weeks. One third of London was destroyed. Blitz is a shorten form of the German word 'Blitzkrieg' (lightning war). When did the Blitz start? 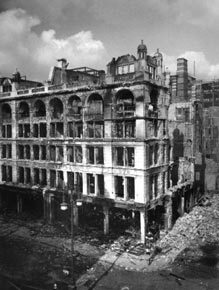 On the 7th September, 1940 the German air force changed its strategy of bombing the British air force (Battle of Britain) and began to concentrate on bombing London. Nearly 2,000 people were killed or wounded in London's first night of the Blitz. During the first month, German Air Force dropped 5,300 tons of high explosives on London in just 24 nights. Most air raids happened at night. How were people warned that an air raid was about to take place? People were warned of a likely air raid by loud sirens, positioned in different parts of towns and cities. During the blitz, they became an almost daily part of life. The sirens made a very loud and long signal or warning sound. For an alert, the siren sound pitch rose and fell alternately. The All Clear was a continuous sound from the siren. Not every alert brought a raid, and sometimes raids happened when no alert had sounded. When people heard the siren they would stop what they were doing and make for a shelter. When you hear the warning take cover at once. Remember that most of the injuries in an air raid are caused not by direct hits by bombs but by flying fragments of debris or by bits of shells. Stay under cover until you hear the sirens sounding continuously for two minutes on the same note which is the signal "Raiders Passed". What other cities were bombed? 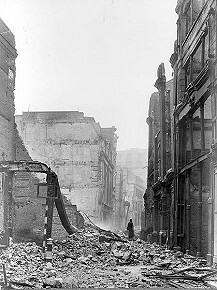 Other cities and towns were also heavily bombed, including Swansea, Cardiff, Bristol, Southampton, Plymouth, Birmingham, Coventry and Liverpool. One devastating raid on Coventry in November 1940 was the biggest air-raid the world had ever seen. 4,330 homes were destroyed and 554 people killed. At one point during the night 200 separate fires burned in the city. How many people died during the World War Two Blitz in Britain? During the Blitz 32,000 civilians were killed and 87,000 were seriously injured. Two million houses (60 per cent of these in London) were destroyed in the Blitz. What type of bombs were dropped? One in every ten bombs that fell was a 'dud'. which meant that it did not explode on impact. But some bombs had a delayed action fuse, which meant they could go off at any time. This meant that it was almost impossible to tell which bombs were which. People had to be evacuated until the bombs had been made safe.